We gathered @ BGSU’s Levis Commons facility to experience mindfulness through music, readings, and mandalas; explore some of the basics of Graphic Recording, and walk and work through several Liberating Structures. Our feature hybrid session included an online/onsite Open Space experience and presentation connecting people and teams in-person and on-line with virtual tools including Zoom video conferencing and GoogleDocs integrated with QiQo Chat. QiQo [quality In - quality Out] founder Lucas Cioffi facilitated us through simultaneous online/onsite Liberating Structures and Open Space activities. The recording is available at the QiqoChat event linked here. Please check out www.nexus4change.com/collaborativearts for updates and info specifically on the Collaborative Arts. Thanks to all who came to our 2nd Great Lakes Collaborative. It was fabulous to have sixty participants online and twenty of you onsite at BGSU@Levis Commons for our first local/global Hybrid World Cafe! 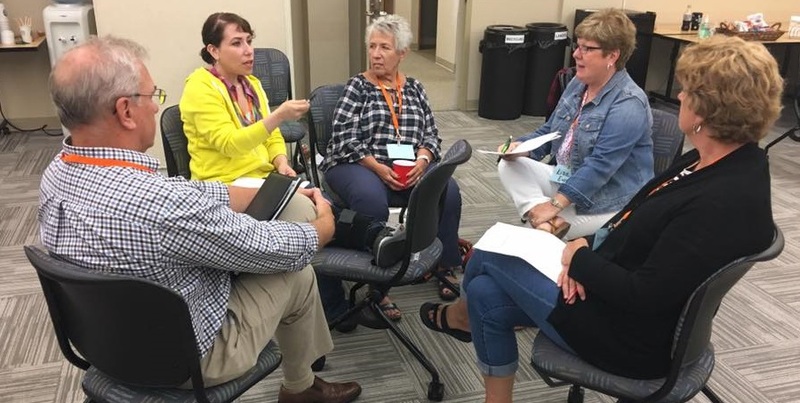 Our KEYNOTE & Feature Presentation was built around a HYBRID WORLD CAFÉ with method co- founder David Isaacs, Frances Baldwin of DesignedWisdom, and Steve Piersanti, founder of Berrett-Koehler Publishers hosted by Steve Cady from Nexus4Change and Amy Lenzo from weDialogue. We had onsite and online participants from Mexico, US, UK, Germany, Brazil, South Africa, Belgium, Singapore, Netherlands, Canada, Indonesia, Burkina Faso, and Switzerland. 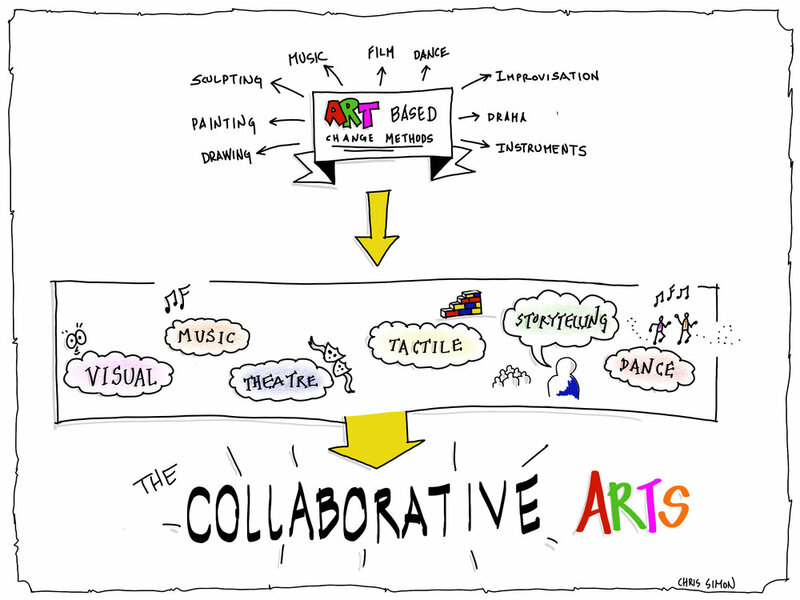 The Central Garden of Collaborative Change Practice: Accessing Our Collective Intelligence. This two and half hour hybrid event modeled a method [World Cafe] and a variety of technologies to explore what is possible now that was not possible before. We shared, learned and experienced both locally (onsite at BGSU @Levis Commons) and globally (via Zoom video conferencing) - a Hybrid World Cafe conversation exploring the Central Garden, or Jardin Centrale in Spanish [http://tinyurl.com/TheCentralGarden] - the “community of communities” through which we can access our collective intelligence and together investigate our learning edges. 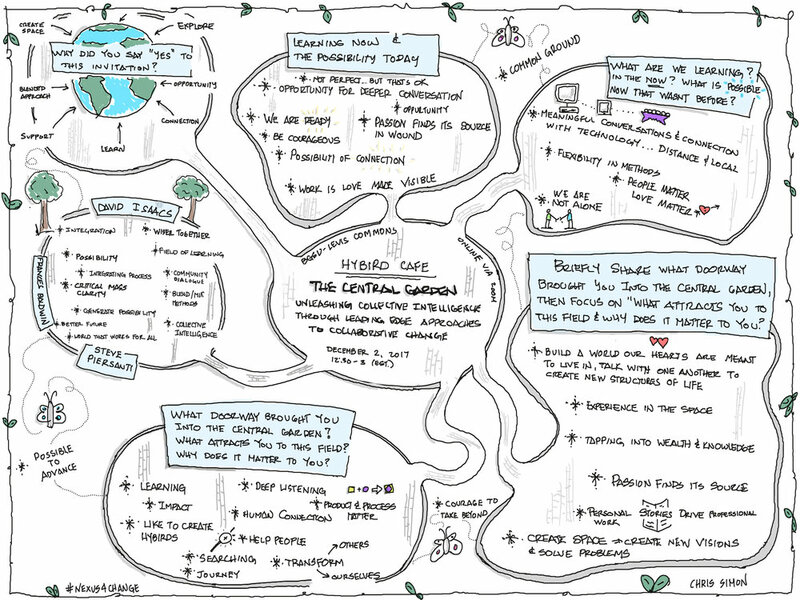 The Central Garden metaphor, coined by World Cafe Co-Founder Juanita Brown, identifies a NEXUS for change, communities and networks engaging in many processes and practices of Collaborative Change as featured in The Change Handbook. 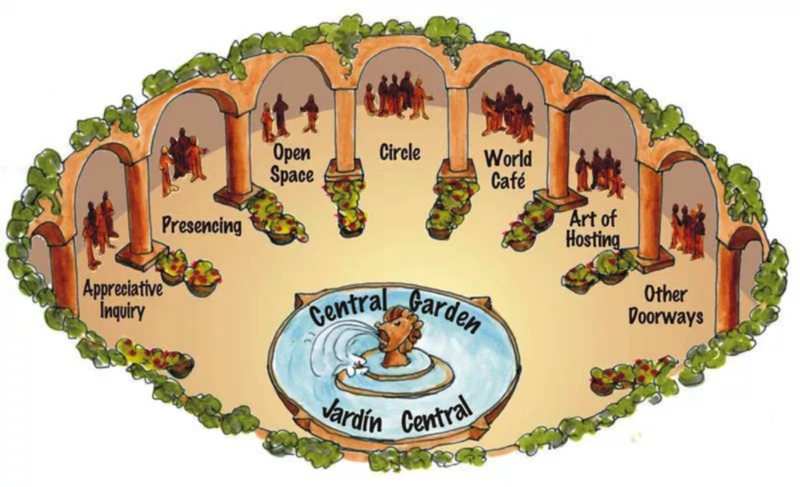 The Central Garden generates the opportunity for collaborative learning where individuals collectively learn more together than they can alone. It nourishes an interconnected root system that allows us to integrate our wisdom, hone our practices, as well as blend & innovate new approaches. We are living in times of unprecedented social and ecological change. Alternative stories are vying for our attention as citizens in countries and communities around the globe. One story tells of global financial crises, environmental catastrophes, and institutional failure, but alternative stories are also unfolding. Collaborative social technologies such as World Cafe that use conversation as a core process have introduced significantly effective approaches to thinking and acting together in response to the challenges of our times. They have introduced effective approaches to thinking and acting together in corporate and educational systems, including institutions like the European Union, the United Nations, and the Municipal Police Department and Family Court System in Chicago, IL, etc. Together we are creating a new story. Thank you to everyone that joined us for the Great Lakes Collaborative. We had a phenomenal experience with 25 in-person attendees and 14 global participants for our keynote webinar. Here are some of the highlights. Theo Stiegler, Chris Simon, and Steve Cady walk us through the graphic recording and touch on the key points from the weekend. "When we do the NEXUS4change events, what we're doing is using the methods, as we learn about the methods, as we build community around the methods and our collective capability and individual capability to do this work better in the world." Webinar: What to do when you don't know what to do! We have several live videos from our Friday design session and Saturday activities on Facebook. Did you make a video? Share it! We took several pictures during the Exchange. Did you take some pictures? Post them and start tagging the people you know!